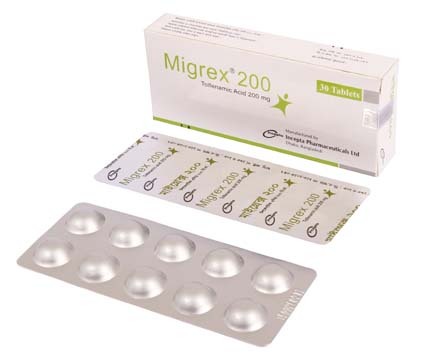 Migrex 200 mg tablet: Each tablet contains Tolfenamic acid BP 200 mg.
Absorption: Readily absorbed from GI tract. Peak plasma concentration: 60-90 min. Bioavailability: 85%. Distribution: Protein-binding: 99%. Plasma half-life: 2 hr. Distributed into breast milk. Metabolism: Metabolised in the liver. Tolfenamic acid undergoes enterohepatic circulation. Excretion: Excreted in urine (90%) and faeces. Migrex is used specifically for relieving the pain of migraine headaches and also recommended for use as an analgesic in post-operative pain, and fever. The therapeutic index for Migrex is high, and gastrointestinal ulceration and kidney changes have only been seen with oral doses approximately 6-10 times the maximum therapeutic dose recommended for tolfenamic acid. Dysuria especially in males; diarrhoea, nausea, epigastric pain, vomiting, dyspepsia, erythema, headache. Tremor, euphoria, fatigue, pulmonary infiltration, & haematuria. Potentially Fatal: Blood dyscrasias, toxic hepatitis. Pregnancy: This medicine is not recommended for use during pregnancy unless considered essential by your doctor. This is particularly important in the first and third trimesters. Not to be given during the third trimester of pregnancy. Lactation: In limited studies so far available, NSAIDs can appear in breast milk in very low concentrations. NSAIDs should, if possible, be avoided when breastfeeding.